India on Saturday called for the waters of the Indo-Pacific region to be better connected and free of threats. 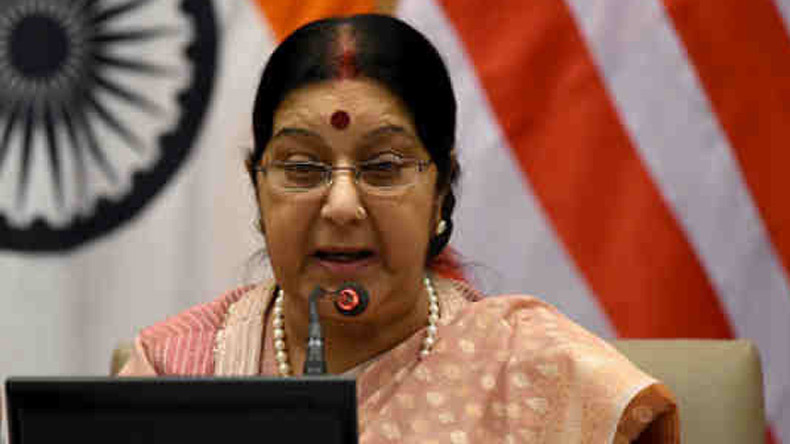 External Affairs Minister Sushma Swaraj said, "These waters must not only get better connected, but remain free from traditional and non-traditional threats, that impede the free movement of people, goods, and ideas. With New Delhi enhancing its engagements with Southeast Asia under its Act East Policy, India on Saturday called for the waters of the Indo-Pacific region to be better connected and free of traditional and non-traditional threats. “The Indo Pacific region is increasingly seen as a connectivity pathway – much of the world’s trade passes through these oceans,” External Affairs Minister Sushma Swaraj said while addressing the Fifth Round Table of the Association of Southeast Asian Nations (Asean)-India Network of Think Tanks here. The Asean comprises Brunei, Cambodia, Indonesia, Laos, Malaysia, Myanmar, the Philippines, Singapore, Thailand and Vietnam. Stating that both India and Asean shared a common vision for global commerce and maritime domain, Sushma Swaraj said that New Delhi looked forward to working closely with the regional bloc in a range of activities like developing a Blue Economy, coastal surveillance, building off- shore patrolling capabilities, hydrographic services, and information sharing for increased maritime domain awareness. She also said that deeper economic integration with the Asean region was an important aspect of India’s Act East Policy. The Indian minister called upon participants of Saturday’s round table to offer new ideas for a greater integration of Asean Economic Community with India and identify collaborative opportunities in investment, trade and services sector. She also called for greater collaboration among educational institutions of India and the Asean nations, saying this would “contribute towards investing in the future of our relationship, especially where it involves the youth of our countries”. “I invite you all to discuss modalities for setting up a network of universities among Asean countries and India, to intensify our cooperation in the education sector,” she said. Sushma Swaraj arrived here from Thailand on Friday on the second leg of her three-nation tour of Southeast Asia and co-chaired the fifth meeting of the India-Indonesia Joint Commission with Indonesian Foreign Minister Retno Marsudi. After addressing the think tanks’ roundtable on Saturday, she interacted with members of the Indian community here before leaving for Singapore, where she will inaugurate this year’s Regional Pravasi Bharatiya Divas on Sunday. Sushma Swaraj’s visit to the region comes ahead of the Special Commemorative Summit to be hosted by New Delhi later this month to mark the 25th anniversary of the Dialogue Partnership between India and Asean. Leaders of all 10 nations of the regional bloc are expected to attend the summit.